Every band goes through a point early in their career when they must make a decision on whether or not their music is worth being pursued. It’s a dreaded decision. That point in the Dunwells’ young career came when the well ran dry and they were without consistent shows. A fortuitous UK tour, an invite to perform at the Folk Alliance Conference in Memphis (which they took advantage of and flew in across the pond for despite their lack of funds), and the subsequent winning of the ‘break-out band’ title at the conference, turned around the favor of the British folk band, and since then, dare I say, they are doing quite well. 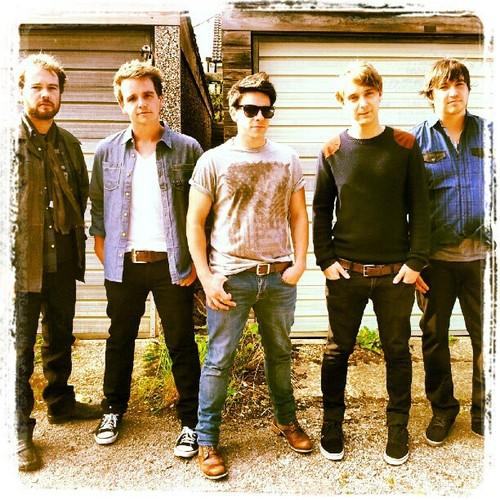 The Dunwells are one of the more intriguing bands I have profiled in a while. They display an authentic brand of organic Americana (despite their Leeds roots) and their powerful harmonies trump folk contemporaries like Mumford and Sons. The band also demonstrates a keen interest in creating variety in their music. Acoustic ballads much akin to Justin Nozuka or even Eric Hutchinson are followed by toe-tapping, riff-smashing Tom Petty-like songs. If I have one criticism with several folk bands today, it is with their lack of variety. The Dunwells crush that convention and then let their skillful harmonies do the rest of the talking. The band was formed by Joseph and David Dunwell, two brothers and former solo performers, in October of 2009. They recruited friends and local musicians to complete their band, eventually ending up with a lineup that consisted of them, Jonny Lamb (drums), David Hanson (lead guitar), and Jonny Lamb’s cousin Rob Clayton (bass). They released their debut single (“Elizabeth” – below) in 2010 and it achieved moderate chart success. Eventually, they were recognized for all the skills mentioned above. It just so happened it came by way of former Cutting Crew keyboardist Tony Moore, who spotted the band and invited them to the folk festival in the United States which then led to them being signed by Austin, Texas-based label, Traffic Records. The Dunwells released their sweet debut Blind Sighted Faith on February 14, 2012. They are now making their rounds touring, and recently were showcased on the Jay Leno Show (their television debut) in August of this year. This is a great sample of why I am so high on this band. This is one of those acoustic ballads I mentioned before. At first listen, I was blown away by the Backstreet Boys harmonies. Seriously, they are that smooth. But do you know what’s scary? There are no effects added to this piece. This is purely acoustic. They are naturally this talented. The song itself is soothing and constructed well. The vocal interplay later in the song is fresh and skillful. It is actually difficult to not like this song. And then BOOM. You are hit square in the face by a song that you could swear is by another band (until you hear the harmonies). The blues-saturated, powerful folk/rock song features instrumental breakdowns, vocal repetition, and a damn effect-driven electric guitar solo. It is an example of a band that knows hard work, exasperation, and, well, good music. No, great music. The inter-connectedness and fortitude supporting the band is refreshing, and I am excited to hear more from them in the future. This is most certainly a band to watch.